“Just take a look at the world. Almost all of the rich and famous brown people are artists. They’re singers and actors and writers and dancers and directors and poets. So I draw because I feel like it might be my only real chance to escape the reservation. Junior Spirit lives on the Spokane Indian Reservation, which is “approximately one million miles north of Important and two billion miles west of Happy”. He was born with some disabilities, and gets picked on for them mercilessly. He has a friend, though-Rowdy, the toughest, meanest kid on the reservation. But Junior sees only one option if he stays: drinking himself to death, like his sister and dad and everyone else he knows. He makes the decision to transfer schools, and go to the all-white, small-town school 22 miles away from home. It’s not an easy choice; the people back on the reservation see him as a traitor. Rowdy gives him a concussion, and he struggles with fitting into the a school full of students wealthier than he is. However, through it all, his cartoons give him a way out. Actually, if it weren’t for his incredible sense of humor and great observations about people, as well as his cartoons, this book would be a sad, heavy read. Junior really gives the story buoyancy with his jokes and drawings. That’s what really sets this book apart. It’s sort of like a cross between Diary of a Wimpy Kid and Mexican White Boy, with a good dose of finding-yourself and learning-where-you-fit-in-the-world at the same time. The issues are serious: alcoholism, racism, tragic deaths, poverty, but Junior’s touch is light and there’s a prevailing sense of hope and humor. 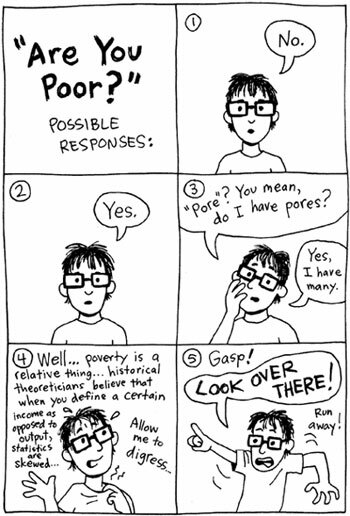 Also, the cartoons (courtesy of illustrator Ellen Forney) are wickedly funny. I highly encourage you to check out this book. 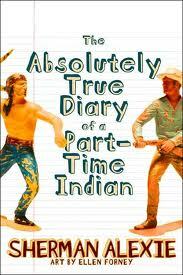 There aren’t many Native American voices out there, and Alexie’s is one you don’t want to miss. Alexie, Sherman. The Absolutely True Diary of a Part-Time Indian. Little, Brown and Co: New York, 2007. 230 pp. Ages 12-16. ISBN: 978-0316013680. If you liked this book, you might also like Diary of a Wimpy Kid by Jeff Kinney, or the graphic novel American Born Chinese by Gene Luen Yang.